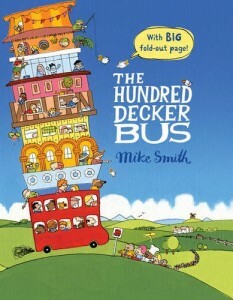 Come and join The Hundred Decker Bus on its colourful journey (and don’t forget your swimsuit, it even has a pool!). The Story: Every morning at the same time the bus driver picks up the same passengers from the same places. One morning he takes a detour down a road that he has never seen before. More people get on the bus and when it reaches the sea the bus boards a ferry. During the trip the sailors build another deck so that they can join the bus on its journey. As more people get on more decks are needed and after a year the bus has a hundred decks. The passengers have a party to celebrate and then the bus breaks down. The journey continues when they are rescued by a………………………….! (I don’t want to spoil the ending!). 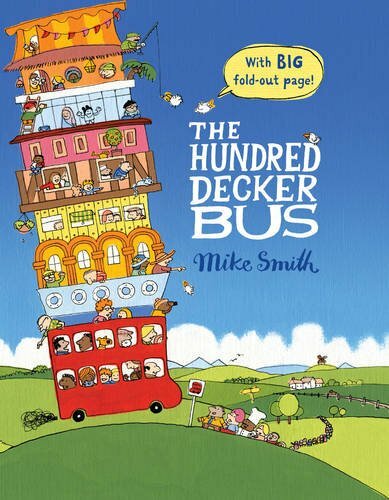 This colourful, fantasy story has a big fold-out page so you can spend ages looking at the details in all the different decks – I think that the hundred decker bus has everything! There are decks for animals, a helter skelter, a windmill and the swimming pool. Each deck has a different architectural style (one deck has turrets!) and there are so many details to talk and laugh about. The spreads are bold and colourful with a mix of full page and double spreads and smaller pictures. We lie on the floor to enjoy the fold-out page and we find something new every time. The wonderful array of colourful, multiracial characters includes a man in a wheelchair, several people with glasses and my daughter always looks for the lady knitting a scarf which grows longer throughout the story! She is also fascinated by the beautifully illustrated map which shows the route that the bus takes. Speech bubbles support the easy to read text and help to move the story along. This book would be a great resource to use in the classroom for creative writing, by the end of the story there are even offices and what looks like a weather station on one deck. We make up our own stories about the people on the bus, what they are doing and why they are there. The book could be read as part of a transport topic and a class book would be fantastic with each pupil drawing or writing about a different place that they would like the bus to visit. The map could be used for a geography discussion and I can imagine a huge picture of a bus on the classroom wall with a different deck drawn by each child in the class. 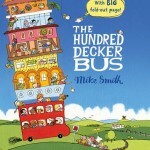 The Hundred Decker Bus is a great story based on a familiar experience. I’m sure that we will continue to find lots of new details in the pictures to talk about. Love love LOVE books like this where you can spend hours looking at the details. Think I’ll be joining the Twitter booky elite in picking this one up asap. Looks like an utterly essential future purchase to me. Nice review Catherine! Thank you. The amount of detail in the pictures is amazing – although it is a story there is an element of ‘You Choose’ for me as there is so much to stimulate discussion. I love it how a child accepts the fantasy element, as an adult I’m thinking about the practicalities of where the money for the materials is coming from and how they can afford to eat! I love picture books and this one sounds like a winner; the kind of book that you can open and find some new interesting detail each time that you look at it. The fact that the book is open ended allowing for creativity makes it so versatile for use across the curriculum. Thanks for alerting me to this Catherine – do you think the pictures are too detailed to work as a class room read aloud though? The pictures are detailed (and you need somebody to stand next to you at the end to hold the last page up when you read it!) but the group of children that I read it to were still fascinated and laughed at the absurdity of the situation although they couldn’t see everything. They all wanted to look at the book afterwards and they all drew a picture of their ideal bus deck. We didn’t have the opportunity to put it up as a wall display but they came up with some interesting ideas.